As the buses left Evan's to head north, we would go right by him. 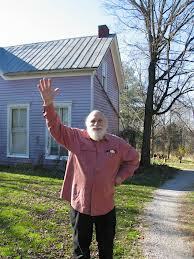 All of us bus kids would wave at him, and he just loved waving back -- often with the double-handed wave! A few people said that he had some kind of mental problem, others said he was a shell-shocked war hero. Then again, maybe he was just a guy that really liked waving at people. This is not him, just clip art.